T-Mobile USA unveiled the first ever HSPA+ smartphone, the HTC G2. T-Mobile along with High Tech Computer Corp.(HTC) announced that the gadget will be available for pre-order, later in the month. The smartphone has been tagged as the only phone that would support the carrier’s faster 3G network. HTC G2 has the capability to achieve the maximum speed of 14.4 Mbit/s which may result to download speeds in 2 to 5 Mbit/s. T-Mobile recently upgraded the network with maximum speed of 21 Mbit/s over the HSPA+ network. 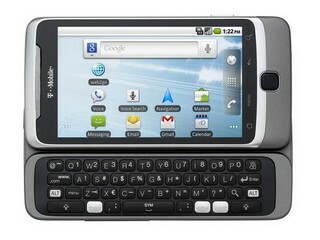 After making the mark on T-Mobile’s network, the HTC G2 has become one of the phone with the fastest connections in the U.S. The HTC G2 features an 800 MHz SnapDragon processor which provides it with the ability to record HD video along with an on-board Flash video player. The smartphone is fully integrated with Google Voice as well as other features such as voice mails to texts. After HTC G1 which was launched back in November 2008, the T-Mobile is happy to welcome the first-ever Android phone HTC G2. 1. Ability To Achieve 4G Speed. Update: BestBuy stores just announced that the pre-sales for the HTC G2 would start from Friday. $199 with a two year contract is what it is offering for the latest and we might want to say the fastest smartphone. BestBuy also revealed that HTC G2 would be available in store from October 6. Next Entry: FaceTime Integration Coming to Mac OS X and Windows?